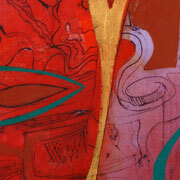 Mary Gottlieb, an artist residing in Ein Hod, Israel has an M.A. in fine arts with a concentration in ceramics and weaving. 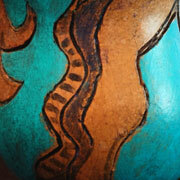 She has been a potter, weaver, printmaker, and now works with artificial clay, gourds, collages and recycled furniture. Mary’s jewelry, made from New Clay (such as Fimo or Primo), is a combination of her clay designs and old jewelry. For the necklaces, she braids waxed thread with clay and inserts the beads. She started growing gourds in California and is fascinated by the various shapes that emerge during the growing process. Each gourd demands a different treatment: some invite her to create necks or beards from their appendages; others call for head extensions, like crowns or headdresses, depending on how they are shaped. Gourds can be fused together to create interesting shapes. 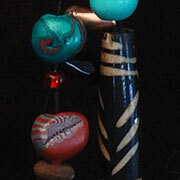 Mary is particularly influenced by works of indigenous peoples and loves to incorporate found objects in her work. Feathers, bones, old costume jewelry, brass artifacts, objects from nature, rusty nails, anything that tells a story is fair game. Humor plays a big part in her creations. She wants people to smile when they see her work, as well as enjoy the beauty of it. 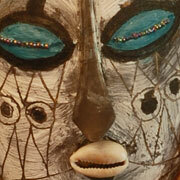 When she is creating a mask, it is placed on a framed background to control color and textural contrasts. The gourd sculptures and vessels are a 3 dimensional extension of the masks. They are usually placed on found bricks, wood, or metal bases. The vessels open and their covers are cut in such a way as to lock when closed, to ensure they will not fall off easily. Mary often decorates them with beads, feathers and objects from nature. She often leaves the gourds their natural color or dyes them subtly to bring out a rustic patina. 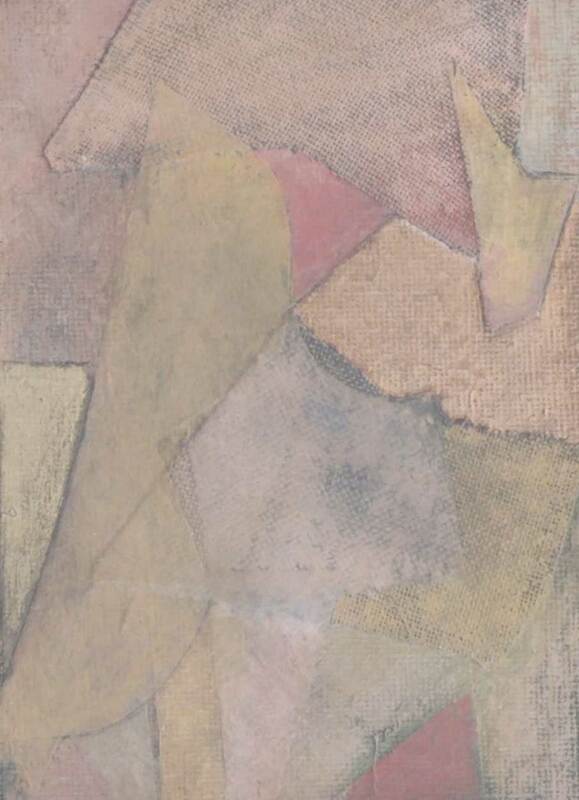 The collages are made up of old collagraph prints torn to preserve pleasing textures and enhanced with additional colors, either acrylic or oil, as well as foils and handmade papers. 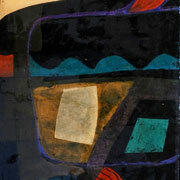 Sometimes the collages are glued to wood and given a lacquer finish to seal them. They then require no glass in front of them and can be wiped with a damp cloth. The framing is an integral part of the collage. The furniture is either found or donated, often in many pieces which are reassembled and then altered to suit Mary’s vision. She loves to use bright colors and often incorporates her prints or painting in her designs. She also does custom tables and can match chairs to them. In summary, an integral part of Mary’s art is the notion of recycling. Her old torn prints gain new life as collages. Discarded furniture is revitalized, and found objects become incorporated in her gourd art. It is a process from which she derives great satisfaction and she hopes her viewers enjoy her vision!